When you commit to selling Medicare Supplements, you’re trading the higher commission you may have earned selling final expense or other insurance products for the opportunity to amass a book of business that will eventually give you exponential residual commissions. That is the biggest pro of selling Medicare Supplements. Related: How To Get Started In Medicare Sales. Cultivating enough trust over the phone to enroll a senior in a plan. The annual need for check-ins (via phone, email, or card). The initial low commissions you make starting out when you don’t have that many clients and have to pay for leads. Renewals can eventually compound to very large commissions. Agents can sell this over the phone more easily than other insurance products. Due to the continued required amount of service work every year, there’s the potential for more referrals. It’s easier to sell Medicare supplement products to seniors and then cross-sell them a final expense plan with the savings, than it is to sell a final expense plan initially and then cross-selling Med Supp. Agents who may be weighing final expense insurance sales versus Medicare supplement product sales will see obvious differences between commissions, the learning curve it takes to get up-to-speed to sell, the amount of annual service required, and the sales environment. A more experienced agent will not look at these two types of insurance in terms of having to sell one or the other, and may decide instead to sell both. If you’re catering to seniors in both instances, why not offer both products? 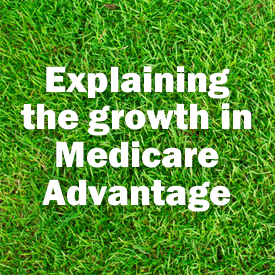 We've entered an era in which predicting Medicare Advantage growth has become difficult and more speculative. The reason it defies predictions is that the Affordable Care Act (ACA) reduced government subsidies paid to MA plans, relative to their highs in the late 2000s. 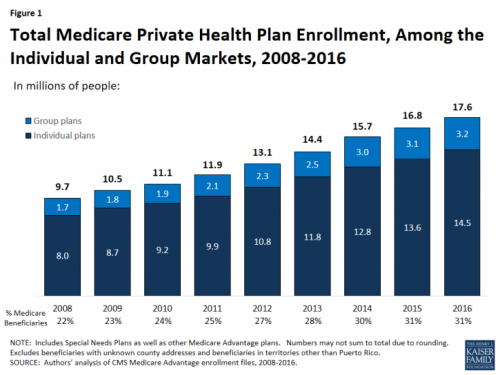 Today, about one in three Medicare beneficiaries is enrolled in a private plan — a record high. Yet, historically, when plan payments have been cut, insurers exit markets and enrollment falls. In the early 2000s, Medicare+Choice — then the name of what is now the Medicare Advantage program, which offers private plan alternatives to traditional Medicare — was struggling. The proportion of Medicare beneficiaries with access to a Medicare+Choice plan declined from 72 percent in 1999 to 61 percent in 2002. The number of plans offered dropped 50 percent, and enrollment dropped 21 percent. Insurance industry representatives said that the problem was that government subsidy payments to plans were not keeping up with costs. The program was renamed "Medicare Advantage" and payments increased as part of the 2003 Medicare Modernization Act. Since then, insurer participation has grown, so much so that by 2007, every Medicare beneficiary had access to at least one plan. The authors point to five factors that may explain continued MA growth in spite of the ACA's cuts to plan payments. First, the cuts were less rapid than previous ones—they were phased in over four to six years, depending on severity by county. This gave insurers time to adjust to lower subsidies, perhaps allowing them to stay in the market with different plans rather than exiting the market. Second, the cuts were tempered by quality bonus payments. They were not as severe as prior cuts, at least not for plans with high quality ratings. Third, Medicare beneficiaries today have had more and better experience with managed care than those of decades past. Managed care plans of the 1990s, for example, were reviled for their onerous requirements and restrictions. Today, many plans demand little of their enrollees, apart from staying within networks for minimum cost sharing. As such, choosing an MA plan may seem to many like choosing something familiar and not strongly disliked, as opposed to traditional Medicare, which may seem foreign. Fourth, MA plans have improved, relative to past years' plans. Network extent in today's MA PPOs may be larger than those of past HMOs. Plan quality and consumer satisfaction meets or exceeds that of traditional Medicare. Fifth, insurers are able to structure MA plans to maximize their attractiveness to consumers. For instance, by keeping premiums low (but, perhaps, making up the difference in cost sharing), plans benefit from consumers bias toward low premiums. 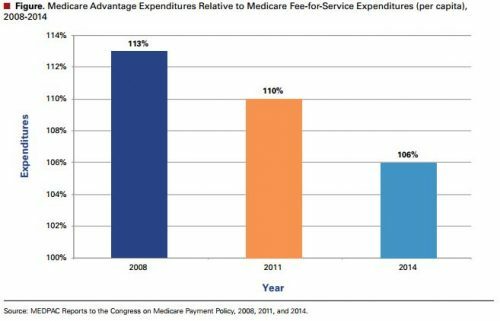 Traditional Medicare, in contrast, is constrained to the same basic premium and cost sharing structure it's had for decades. It has no ability to rapidly adjust to the innovations presented by MA plans in the market. Another factor, not mentioned in the article, may be that employers are dropping or decreasing the generosity of retiree Medicare supplements that wrap around traditional Medicare. As supplements become relatively more expensive or unavailable to consumers, highly subsidized MA plans that largely fill the same gaps may appear more attractive. These are all the standard explanations for MA's surge that I've heard. One challenge is that few of them are readily testable with available data. Because MA's cost to Medicare is different than TM, predicting MA enrollment is important for projecting future Medicare costs to taxpayers. We've entered an era in which such prediction has become difficult and more speculative. 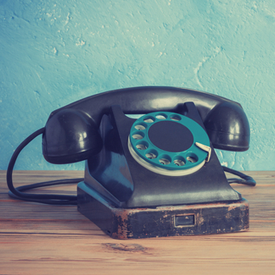 Most salespeople are eager to know the best time to cold call their prospects. It’s an enticing idea: Rather than waiting for a compelling event, researching the buyer, and crafting a personalized message, the rep simply needs to know the best day for cold calling, as well as the best time of day. Unfortunately for legacy salespeople, this approach doesn’t work anymore. An oft-cited study from the Keller Research Center at Baylor University shows only 1% of cold calls ultimately generate appointments. The takeaway is, the “best time to make cold calls” doesn’t exist. But it’s a different story for warm calls. If you’ve done your homework and identified a potential good fit, knowing when to pick up the phone can mean the difference between getting the prospect's voicemail -- and getting a meeting. A study conducted by LeadResponseManagement.org revealed Wednesdays and Thursdays are the best days of the week to call prospects. This finding isn’t completely surprising. After all, people are usually gearing up for the weekend on Friday and aren’t interested in starting a relationship with a salesperson. On Monday, buyers are transitioning into work mode and planning their upcoming week. By the middle of the week, people have had enough time to settle into their working week and take care of pressing matters, without your call feeling like an interruption. Making an early morning sales call lets you connect with prospects before their to-do lists become overwhelmingly long. But timing is still important -- call too early, and no one will answer. Call too late, and your prospects will be busy. 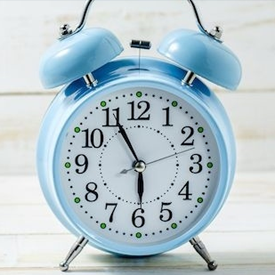 The same LeadResponseManagement.org study found morning sales calls are most productive between the hours of 8 and 9 a.m..
What are most prospects doing between 11 a.m. and 2 p.m.? That’s right: Eating lunch. Reps see the highest engagement rates of the day between 4 and 5 p.m. Most prospects are tying up their projects for the day. This is a great moment to pick up the phone and give your buyer a call. With important work out of the way, your prospective clients will more time to chat and listen to what you have to offer. Seeing leads come in is always exciting for sales reps, but the time it takes you to respond to these prospects is crucial. From the same study conducted by LeadResponseManagement.org, the timing of the response played a big part in the success of making contact and qualifying. 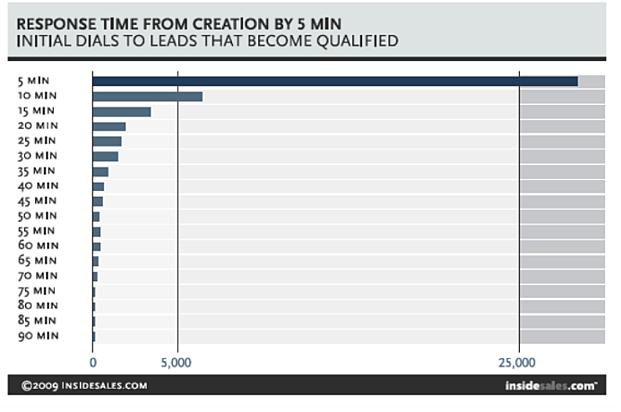 The graph above demonstrates how a response time of no more than five minutes after receipt results in a much higher number of qualified leads. After 10 minutes, the number of leads qualified significantly decreases, which shows a quick response will return the best results. Ultimately, picking the right time to make your sales calls is essential to sales success. While these five rules of thumb are a good place to start, you may find that different strategies work better for your business. Test these approaches and adopt the ones that work for you. 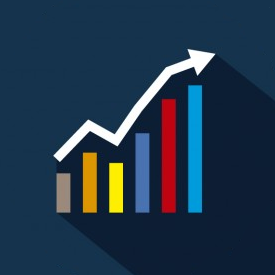 You might be surprised to find how many more prospects you can reach with a few simple tweaks. 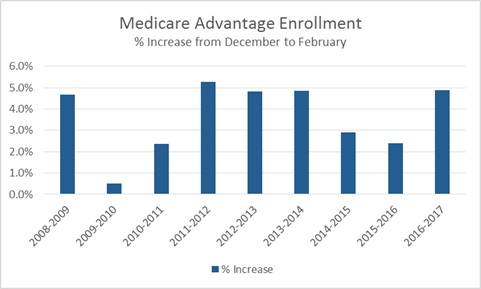 Medicare Advantage enrollments as of February 2017 reflected a higher year-end growth than the previous two years, and consistent with the percentage growth in 2013 and 2014. 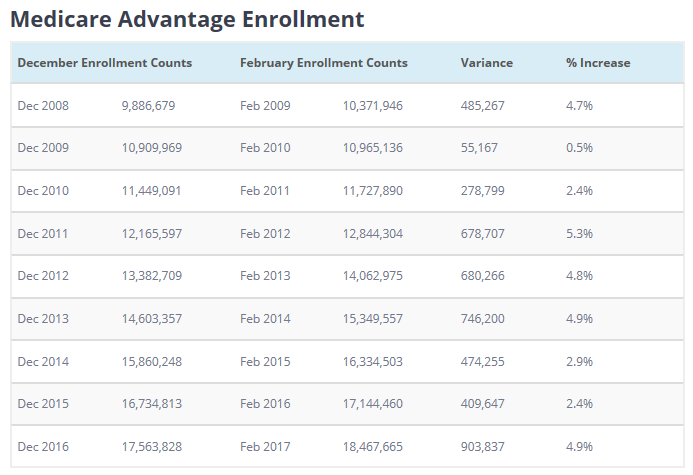 The table below shows that Medicare Advantage enrollments increased over 900,000 from December 2016 to February 2017, substantially higher than the growth in a count and percentage basis than the previous two years. Based on these February 2017 enrollment numbers, CSG Actuarial is projecting that Medicare Advantage enrollment as of December 2017 will be 18.9 million (or 20.1 million if other Medicare “capitation” contracts are included).